The convention took place over 4 days – the first 3 operating as a professional event, with healthcare practitioners earning continuing professional development (CPD) points for attending, and the last day defined as a public event. There are also a number of skeptical dieticians here, as well as a few GP’s that I know to be critical, after having discussed this issue with them at various talks over the past few years. But what I suspect Noakes and Thomson thinks proves the boycott point is that none of the 15 critics who were invited to participate in a debate accepted the invitation to do so. I’ve explained why I would not have done so in a previous post – and can also tell you that I was part of email correspondence with 5 of those who were invited, who (thanks to the choice of debate topic) thought the invitation in bad faith, given how much it stacked the deck against them. Anyway – enough back-story. I mention these things mostly to make the point that there’s lots of room for “eye of the beholder” interpretations of reality here, and crucially, also for subjective interpretations of evidence. This is not because the evidence itself is subjective, but more because what you are exposed to (and crucially, what you are not exposed to), cannot help but frame your interpretation of things. If you construct a case that only represents one point of view, it’s little surprise to find that point of view emerging with credit. To highlight some positives from the conference right off the bat – the catering has been very good, and the organisation (excepting the schedule not consistently allowing for questions, discussed below) exemplary. So, well done to all – there have been 400+ people here every day, and having organised this sort of thing myself in the past, congratulations are well-deserved. Which brings me to my first general critique – if you want a conference to be viewed as an objective overview of current science, giving equal (or at least substantial) airtime to critics seems a good idea (whether via a fair debate topic, or via giving them opportunity to make presentations). A related point – opportunity even for questions from the audience has been irregular and often non-existent. At the very least, a programme on a controversial topic like this (if academic/scientific objectivity is a goal) should include dedicated time for questions. So, the event is framed in such a way that sympathetic folks will get to hear more about something they are already (at least somewhat) committed to, and – unfortunately – that folks who view authority uncritically (as in, here’s yet another “expert” defending LCHF) will get the impression that LCHF is the dominant view. You might think it should be the dominant view, sure. But I mention this to note that when people ask me (as quite a few have, including one rather abrasive journalist) whether I’ve been persuaded by being here, I have to keep reminding them that persuasion occurs – or should occur – after you’ve heard the best articulation of competing points of view, and then conclude that one is stronger. Having said that, I’ve independently exposed myself to various points of view and arguments on the mainstream or consensus side, so do have some ability to weigh these up against what I’ve heard here. Others might not have had the same opportunity, which is why – if I was one of the speakers here – I’d have made sure to emphasise that what’s being presented here is not obvious, inescapably true and so forth. So, if you want to know about the current state of research into LCHF, this is certainly the place to be. If you want to know about the current state of research into diet and health, not so much. But it has been useful to me, both in terms of understanding their arguments better, but also in terms of noticing (a) they don’t agree with each other about everything; and that (b) Prof. Noakes is arguably on the extreme end of commitment to various propositions, with other voices emerging as more convincing in consequence (because dogma is antithetical to good science). So, hearing the arguments expressed in a less hyperbolic way than South Africans have typically been exposed to has been very useful. It’s like hearing about Jesus from a religious studies professor versus from Errol Naidoo or Pat Robertson, if you get my meaning. For example, at least one speaker (and others in conversation) used the phrase “low carb, healthy fat” (healthy, instead of high, for the H in LCHF). My primary concerns – and the concern of consensus guidelines at present, has been about the extreme stance that a person like Prof. Noakes takes on these matters – not only limiting carbs, but limiting them severely; not just being unafraid of certain fats, but embracing those fats as well as saturated fat. If we limit refined carbs, and eat more healthy fats, then we’re in the territory of the Mediterranean diet, which is pretty much how I’ve eaten for the last 8 years in any case, and also what my reading suggests is the diet recommended by most experts. But the problem remains that even those who spoke of “healthy fat” peppered their speech with talk of addiction, or the evil 1977 McGovern report which led to the dietary guidelines that have “made us sick”, and various other tropes from the LCHF playbook. No amount of repetition seems to make this point stick, but the dietary guidelines in question never told us to eat lots of refined carbs, and in fact cautioned against sugar – but we never followed them. They did tell us to limit fat and be careful of cholesterol, yes, but they have since caught up with science (policy inescapably lags behind science, given committees, consultation and the like). And sure, I’m sympathetic to the point that “big food” added sugar to compensate for less fat – but that’s a a separate point in that it explains (in part) why we ended up eating too much sugar, but also tells you that we didn’t follow the guidelines, albeit not entirely because of informed choice. It’s possible, in short, that we wouldn’t be in the state we’re in in terms of obesity and/or non-communicable diseases if we had followed the guidelines then, or start following the guidelines now. The burden of proof, in other words, is still on people who want to propose an alternative to guidelines based on the totality of evidence. 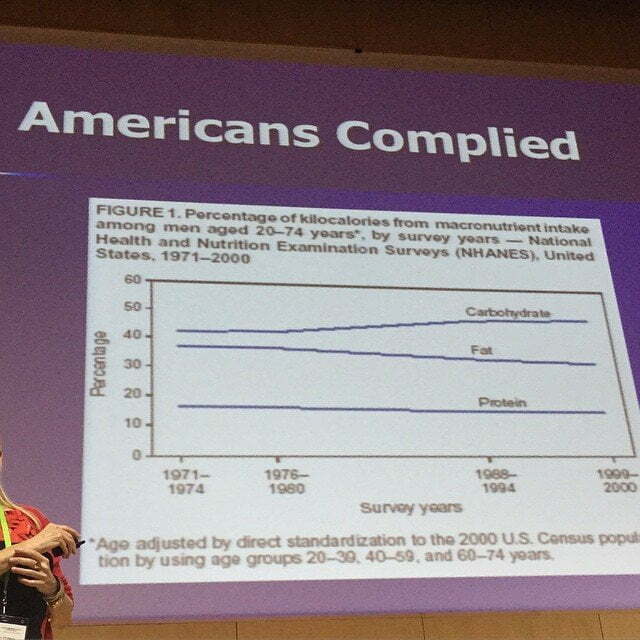 Anne Childers repeated this misleading claim about the guidelines, showing us a graph of NHANES data, according to her showing that Americans complied with those guidelines (in that carbs were up, fat was down, yet obesity increased). But that shows us nothing of the sort, in the guidelines were not “increase carbs in general”, and folk ended up (whether via the evil Big Sugar or not) eating far too many of the wrong sorts of carbs. They didn’t eat the fruits and whole grains they were supposed to, and they ate far too many of the refined grains and desserts, while guzzling plenty of soda. The review suggests that fat-restricted diets are no better than calorie restricted diets in achieving long term weight loss in overweight or obese people. Overall, participants lost slightly more weight on the control diets but this was not significantly different from the weight loss achieved through dietary fat restriction and was so small as to be clinically insignificant. Read the abstract for yourself, or the full report if you have access, but it tells us that the weight loss in the “low fat group was -5.08 kg (95% CI -5.9 to -4.3 kg) and in the control group was -6.5 kg, (95% CI -7.3 to -5.7 kg)”. So, people did lose weight in the calorie-restricted diet, and the “clinically insignificant” from the Cochrane report refers to the difference between the two diets, not weight-loss in a calorie-restricted diet. As you might expect, many speakers retreaded the line about this all being the fault of Ancel Keys and his allegedly manipulated data (cherry-picking 6 data points instead of the full 22 he had access to, when arguing that heart disease correlated positively with fat intake). But as others have argued in detail, the correlation remains if you include the full 22 countries, and the fact that everybody plagiarises Gary Taubes in saying otherwise doesn’t make it more true. We also heard some odd contradictions between speakers – Christine Cronau wanted us to believe that fibre “tears holes in our bowel walls” and was to be avoided, Dr. Jason Fung thought fibre was cardio-protective and in general good. During a rare question session, Dr. Eric Westman explained the contradiction as being attributable to “different philosophies”, which hardly seems a compelling answer in matters of physiology. Dr. Aseem Malhotra gave a talk of two distinct halves – the first half great, on innumeracy, false positives, over-prescription of drugs and the like. But he also engaged in some conspiracy theorising around funding sources for research, and repeated the question-begging narrative about the dietary guidelines. More weird, perhaps, is that his arguments all seem to support the Mediterranean diet, and then his conclusion veered off into the LCHF direction (maybe he’s being paid off by Big Cauliflower? (I joke, of course.)). The prize for most bizarre statement must go to Dr. Robert Cywes, who told us that “Two hours after a high carb meal, you have effectively swollen your brain and caused concussion”. As The Doctor remarked, those poor Italians must be in a state of perpetual concussion! On the final (public) day, Dr. Aseem Malhotra was the highlight, in focusing (in quite sober tones) on the consequences of overconsumption of sugar, and how easily you can consume too much without noticing it. My respect for him was undiminished, and possibly enhanced, over the two presentations he gave here. The main disappointment on the final day was to hear “The Diet Doctor”, Andreas Eenfeldt, repeat the falsehood that Sweden’s SBU has shown that LCHF is the “best” diet. As I’ve written before, and as Slipp Digby has extensively catalogued, they said nothing of the sort. Their report discussed diets for obesity – not everyone – and even so, found LCHF superior only on a time horizon of 6 months or less. Even the SBU authors have made this clear, after LCHF advocates started trumpeting the (false) claim, so it’s rather disturbing to see Dr. Eenfeldt take advantage of a primed-to-be-receptive audience in this way. I’d have hoped that misrepresentation was incompatible with the LCHF understanding of primum non nocere – first, do no harm. But perhaps Eenfeldt is simply misinformed. Prof. Noakes wrapped proceedings up, first discussing causation. I’ve written enough about him, so will just say: no, calling your success story anecdotes Black Swans neither makes them good examples of Black Swans, nor makes them more than anecdotes. They were uncontrolled experiments, so we have no way of knowing cause-effect worked the way you claim it did. Saying that it proves your case begs the question. But he was charming, as usual. Two final points before concluding: for a medical conference (on the first 3 days – the final day was for the public), with continuing professional development (CPD) points on offer, it was a tad disappointing to hear two purely autobiographical talks on the first day. But this again speaks to the purpose of the conference, as indicated above – it was constructed filter-bubble, rather than a general investigation of the issues. Second, Old Mutual were careful to distance themselves from the LCHF diet and movement itself, despite apparently throwing buckets of money at it. I’m not sure if this is a winnable game to play (in terms of public impression of them being supportive), but there were three mentions of this not being a show of scientific support by Old Mutual in the first half-hour of the conference. They argued that they merely wanted to facilitate the debate, help create the space for discussion, and bring information to South Africans. Credit to them for that, as these are worthy goals, but I can’t help thinking that they should then have insisted on the programme being more balanced. In the absence of that, they can’t blame people for thinking they’ve offered an endorsement. Others can pick over the details once the talks are on the web, as I’m told they will eventually be. But to summarise, I heard plenty that further convinced me that refined sugars are (in general) bad, and that (certain) fats are not a problem. I better understand the arguments for why this is the case. So, I’m pleased to have been here, and feel like I’ve learned plenty. A last point: I’ve enjoyed having more personal contact with some folks who I’ve previously debated or encountered on social media, notably Karen Thomson and Dr. Gail Ashford, both of whom are pro-LCHF. Thanks to you both for the civil and often fruitful engagements we had over the past four days.